This shibori dyeing technique requires a little patience and time, but the effects are stunning and truly one of a kind. 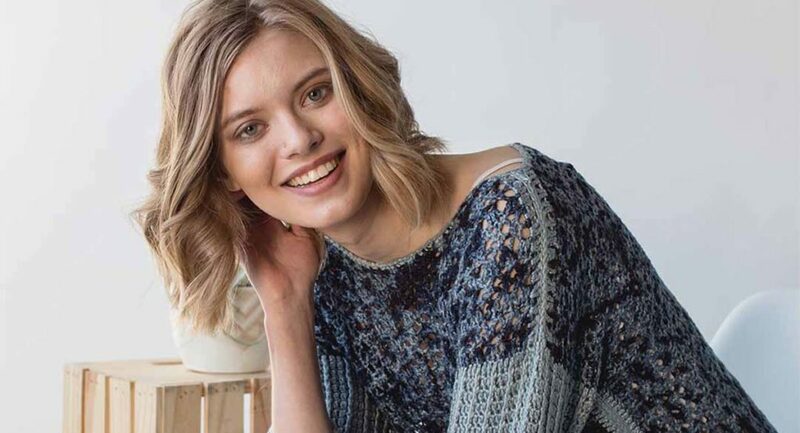 This blue-on-blue shibori dyeing technique accompanies the Blue-on-Blue Sweater from Interweave Crochet Summer 2018. Grab the issue for the sweater pattern and to try out other shibori dyeing techniques. To create this effect, wet-block the Blue-on-Blue Sweater’s front and back panels to the dimensions shown in the schematic in the pattern and let them dry. 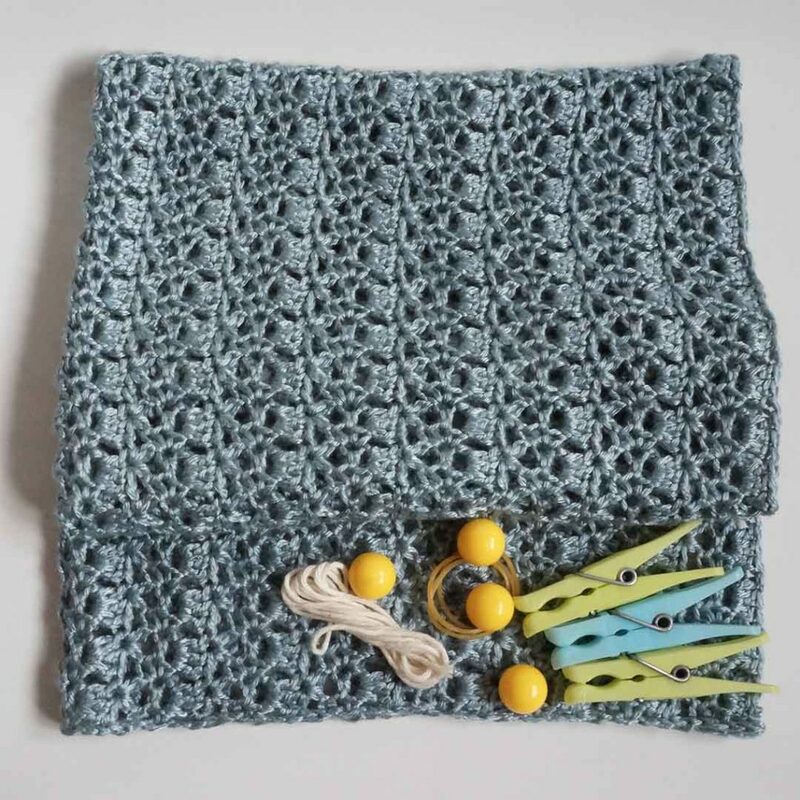 Collect the materials needed: blue dye, yarn needle, waste yarn, marbles, rubber bands, and clothespins. The dyeing technique involves working multiple rows of gathered running stitches all over the fabric. 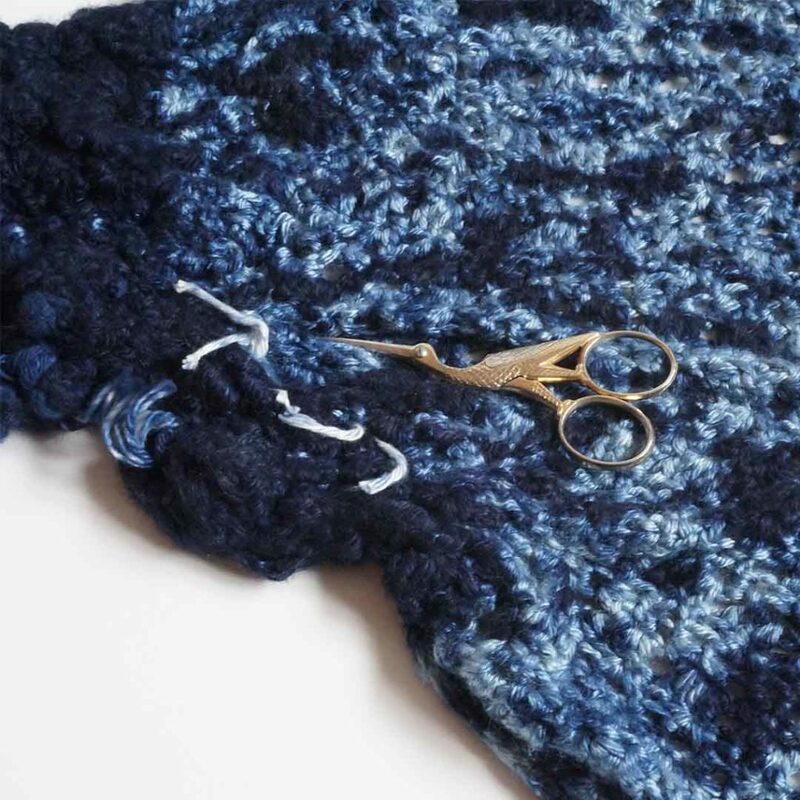 Choose a waste yarn that is different in texture, color, and composition from the yarn used for the sweater. Thread a length of waste yarn through your yarn needle and work running stitches in different directions throughout the fabric. 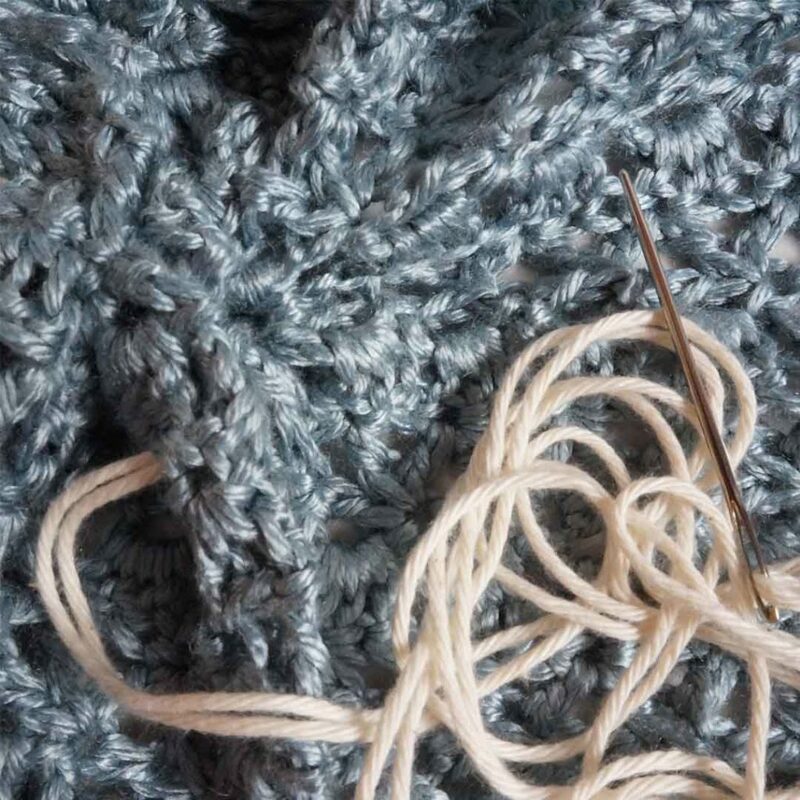 It’s important to use different stitch lengths to achieve a random effect. Pull up the gathers tightly every few stitches; this will exclude the dye from more of the fabric and ensure that the original color remains visible after the dyeing process. Check over the panels after gathering; any open areas can be filled by a marble or secured with a rubber band. You can also use clothespins to secure areas of ungathered fabric. Prepare the dyebath following the manufacturer’s instructions and dye both panels at the same time. Leave the pieces in the dye for the recommended length of time, stirring occasionally. Remove pieces from the dye, thoroughly wash and rinse them following the yarn manufacturer’s instructions, and leave to dry. Wait until the fabric is almost dry, then take out pegs, bands, or marbles and cut the gathering threads. Have patience, a pair of sharp, pointed scissors, and a good light. 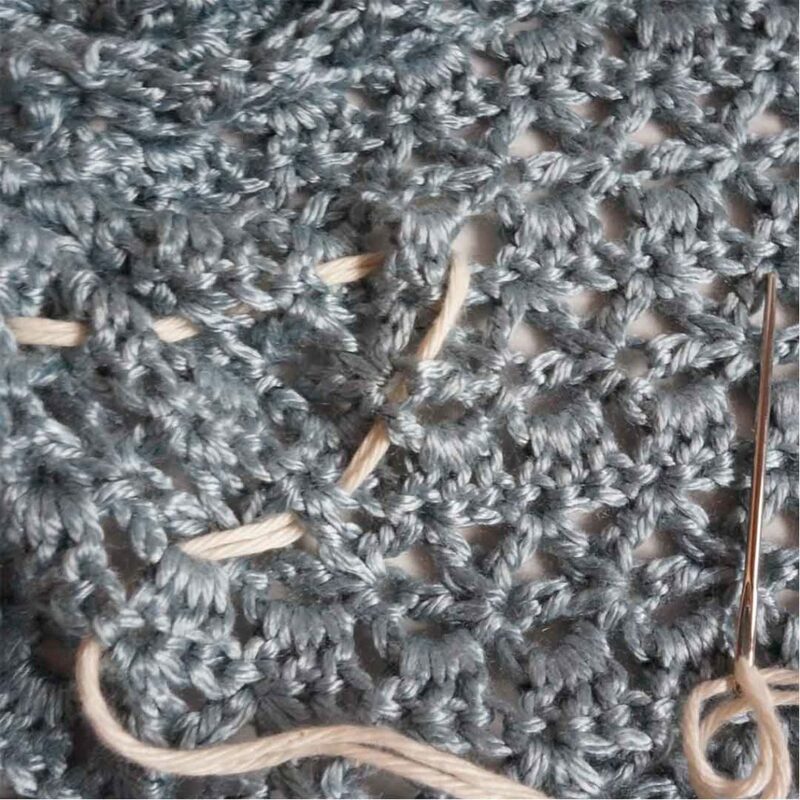 Cut carefully, and if in doubt about whether a thread is a gather or is part of the panel, leave it and undo a different area before revisiting the thread in question. When all the gathers are removed, spread out the panels and let them dry completely. 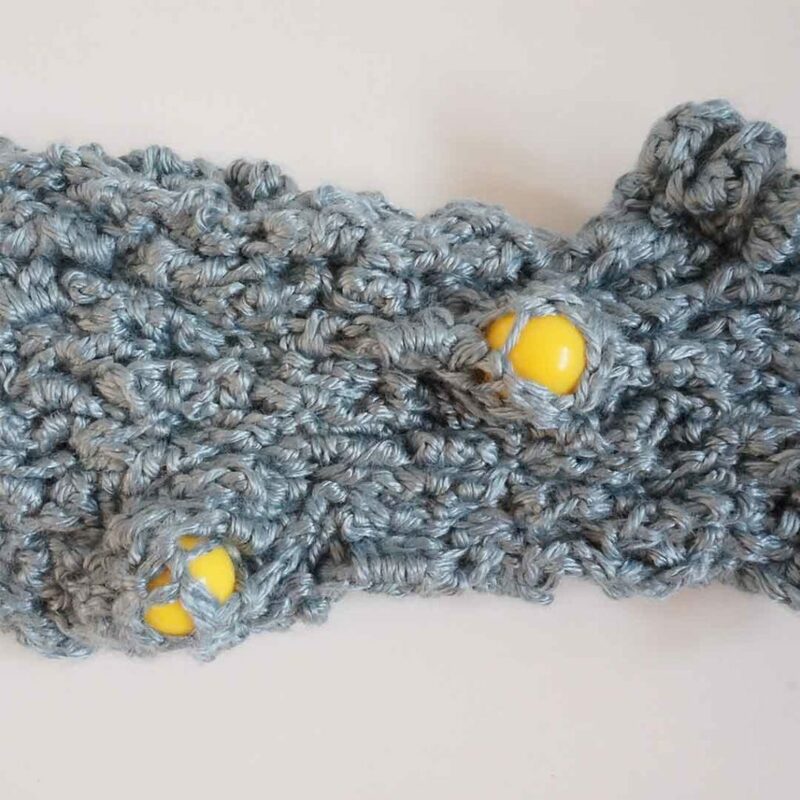 JANE HOWORTH has been crocheting since she was a child and combines full-time designing with teaching in North Wales, United Kingdom. She always aims to stay true to her principles of designing beautiful, fashionable, and wearable items. Find her on Facebook, Ravelry, and Twitter @JaneHoworthKnit. 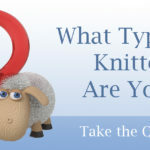 Find so much more, in the Interweave store!